Mr. Walsh holds a Master of Science Degree in Management and Business Administration from Dublin's Trinity College. 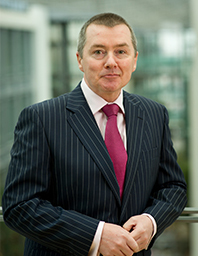 He served as the Chief Executive Officer of Aer Lingus Group Plc from October 2001 to May 2005. Mr. Walsh joined Aer Lingus Group Plc in 1979 as a Cadet Pilot and has held a number of senior positions including Chief Operations Officer and Chief Executive of its Futura subsidiary since 1998. He has been the Chairman of National Treasury Management Agency since December 2014. Mr. Walsh served as Chief Executive Officer of British Airways Plc since October 1, 2005 and its Executive Director from May 3, 2005 to January 21, 2011. He also served as Member of the Management Board of British Airways Plc.